STOCKHOLM - Iraqs former leader Saddam Hussein hopes for clemency and wants to live in exile in Sweden, Austria or Switzerland, reports said Tuesday. I wonder how much of this is Saddam and how much is his lawyers. Where does he find these information ministers? I have a hunch trial lawyers comprise the primary recruiting pool. 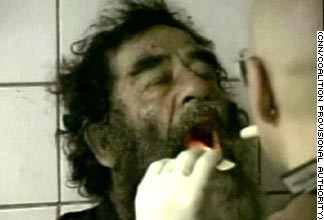 ...In Saddam Hussein’s case the charges are pure trash,” Di Stefano was quoted as saying. The British-based Di Stefano had previously said a trial against the former Iraqi leader was doubtful since Saddam Hussein had immunity as head of state. ...In the new interview, Di Stefano questioned if Saddam Hussein could be linked to the 1998 nerve gas attacks against Kurds in Halabja. Di Stefano added that Saddam Hussein was planning to run in the Iraqi elections slated for January next year. “Before that it is impossible to stage a trial. We would need at least two years to prepare a trial against Saddam Hussein with the existing documentation,” Di Stefano said.